I have to begin by saying that this idea was inspired by a different website. I was introduced to Disney Food Blog run by AJ Wolfe in early 2013. As a “foodie,” or in medical terms, a food addict, I love to eat. Disney Food Blog (DFB) therefore had me mesmerized by the amazing eats available at Disney parks. Since I had an upcoming trip to Disney planned at the time for the Flower & Garden Festival, which this year included food kiosks, I decided to go all out and try every item from DFB that I felt was a “must try” item. The choices included everything she blogged about this year plus anything I found through the links within those blogs. In other words, my possible choices probably covered most everything mentioned in that website. By the start of the trip my list of things I was wanting to try had grown to over 90 individual items. 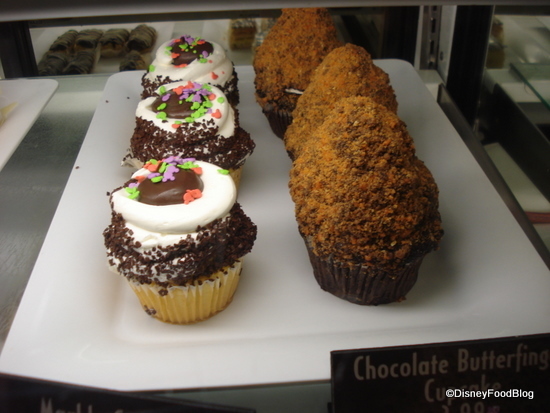 Most of them are small snacks such as the marble cupcake and Butterfinger cupcake shown in this photo, which I found here on DFB’s site. I had four days on the trip, with three in the parks and one outside the parks where I could still eat at Downtown Disney and the resorts. It was starting to look like this would be an ongoing venture attempting to try everything I wanted to eat at Disney.